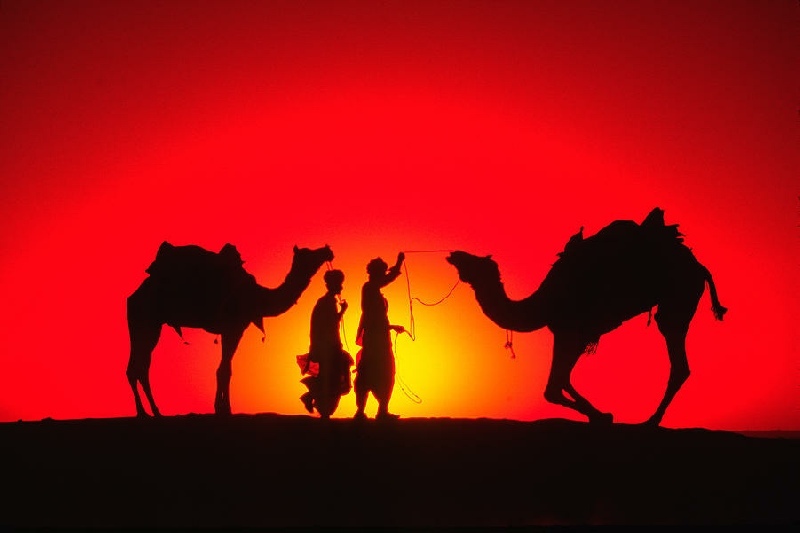 This trip begins in evening, we organise the camel ride for the night in desert from a hotel near the sand dunes, The camels will be packed with foods, blankets and everything else which we will need. The trek will start right into the desert for 90 min. We will spend the night in an equipped camp with drums music in the middle of the Sahara,this is a great opportunity to take lovely pictures of the sunset and sunrise, when we arrive at the camp we walk to the high dunes to see the sunset. 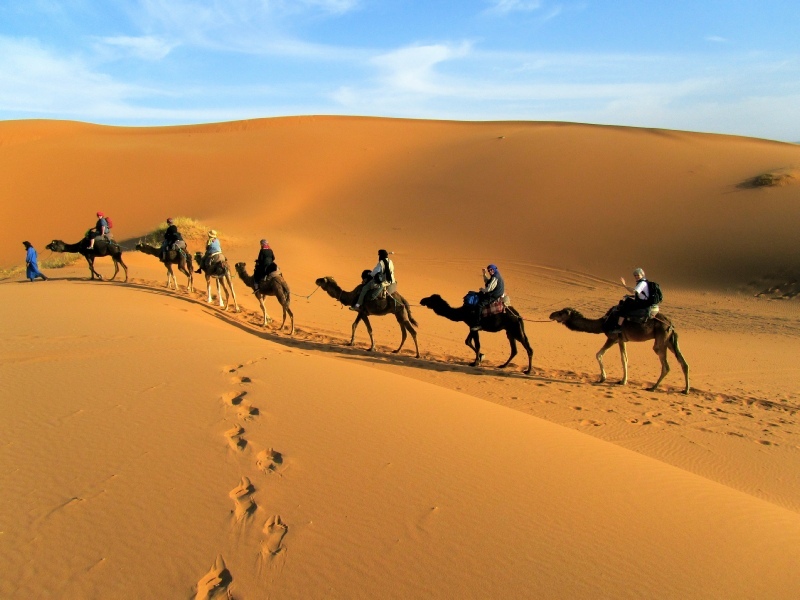 During the first night, there will be a wonderful dinner around a campfire,we will spend the night in nomad tents ,In the morning we will ride the camels backing to Merzouga , you'll have the breakfast and shower in the hotel in Merzouga. The Sunset tour begins around 5:30 pm. 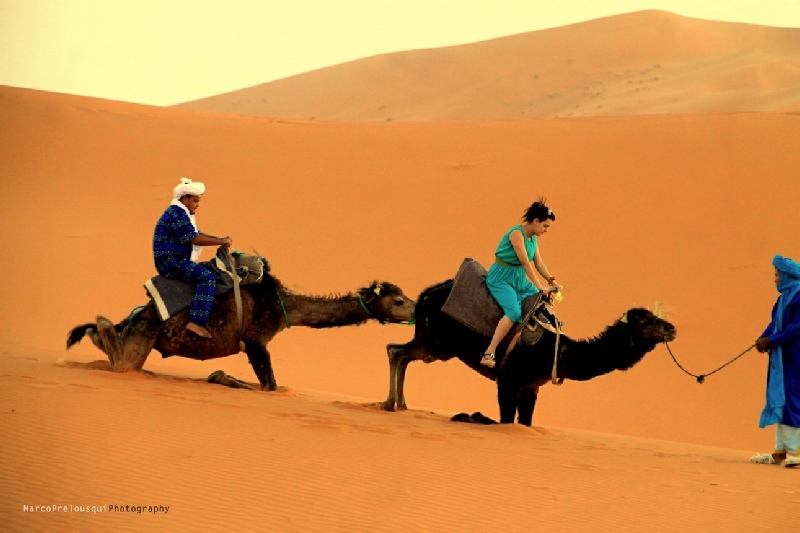 It takes almost half a hour to reach the sand dunes of Erg Chebbi on top a camel. Then, we will leave the camels in about 80 meters to reach the highest dune of Merzouga. For those who want to see a panoramic view they must climb to the top, it will takes them another 10 minutes. If you prefer not to hike up the highest dunes, the area around the camel "parking" is perfect to watch the sunset. After having enjoying that short time we travel back to the village. This tour includes a stop at the garden where you will have a short explanation about the canal system. 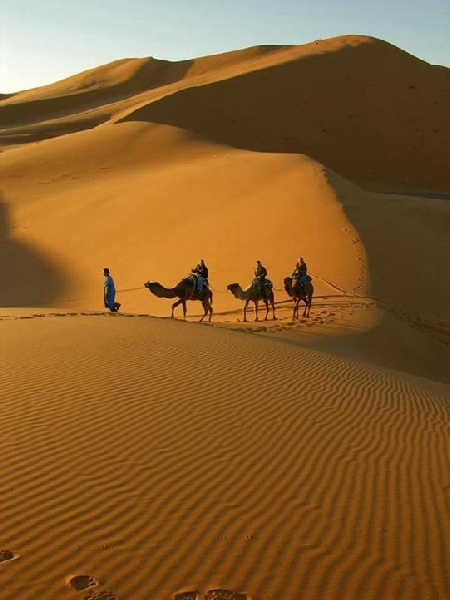 The Sunrise Tour starts early and takes 35 minutes to reach the highest dune of Merzouga. This tour included a visit to the garden on the way back. For this tour you don't need to set the alarm clock. Enjoy your night and we will come around for a wake-up call. This trip begins in evening, we organise the camel ride for the night in desert from a hotel near the sand dunes, The camels will be packed with foods, blankets and everything else which we will need. The trek will start right into the desert for 1:30 min, We will spend the night in an equipped camp with drums music in the middle of the Sahara,this is a great opportunity to take lovely pictures of the sunset and sunrise, when we arrive at the camp we walk to the high dunes to see the sunset. During the first night, there will be a wonderful dinner around a campfire,we will spend the night in nomad tents ,The next day In the morning after the breakfast in the camp we will ride the camels to visit and lunch with nomad peoples , after relax and lunch with the nomad peoples we will ride the camels backing to the camp, when we reach the camp, we leave the camels and we will take the sand broads and we walk to the high dunes , we will visit a oasis into the dunes & we walk back to the camp after the sunset, the next day in morning we will ride the camel backing to Merzouga after the sunrise, you'll have the breakfast and shower in the hotel in Merzouga. For those wishing to enjoy desert different way with activities , we offer sand boarding, 4x4 driving, quad driving. Please contact us for more detailed information and also check our Merzouga desert activity page. From Fes: There are daily bus from Fes to Merzouga, leave Fes at 8pm and arrive to Merzouga at 6am in the morning / The buses called “SUPRATOURS” and “CTM”. From Marrakech: There are a daily day bus leave Marrakech at 8 am in the morning and arrive to Merzouga at 9 pm / The bus called (SUPRATOURS). 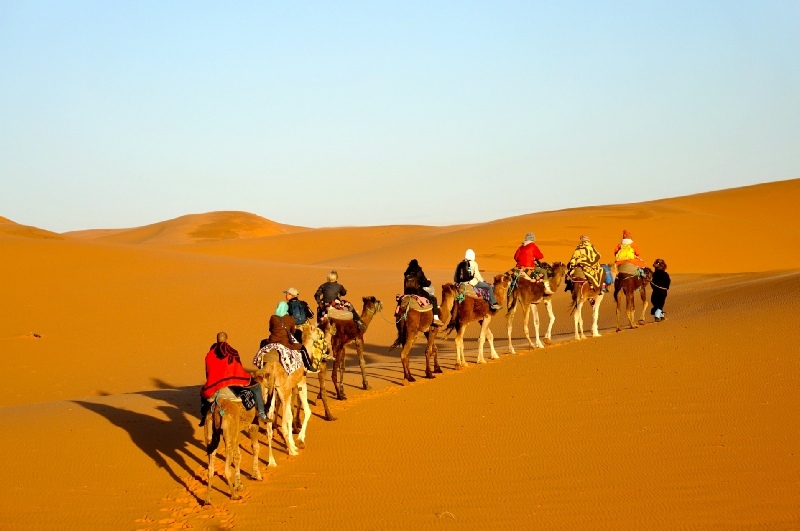 How you will meet us in Merzouga (desert)?? 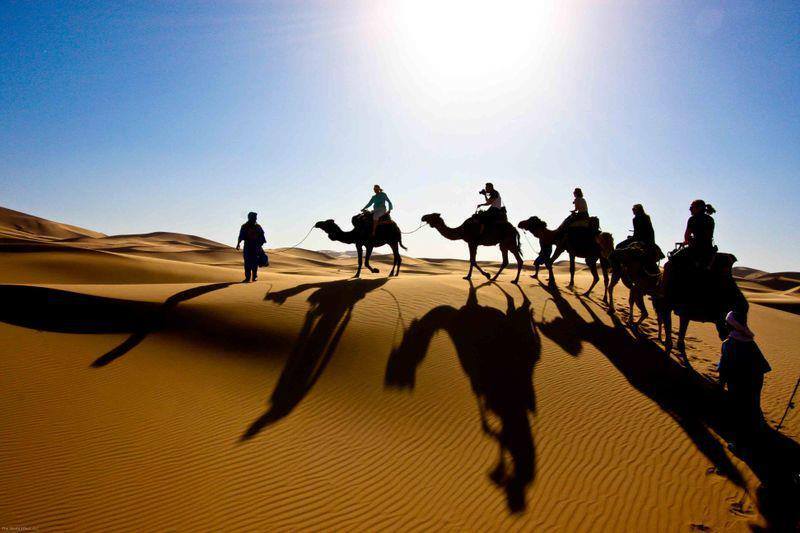 If you have a rental car: We will meet you at our Hotel Maison Adrar Merzouga where you will have a room to leave your luggage that you will not take with you to the desert and for shower when you come back from your desert camel trek!